THE STORY - Police partners descend into the criminal underworld after they are suspended for assaulting a suspect on video. THE GOOD - Zahler still has a unique voice even if you don't agree with it. THE BAD - One of those instances where the deliberate pacing does not suite the storytelling and instead hinders the entire viewing experience. ​Oh no. I spoke too soon. In my review for "Brawl In Cell Block 99," I heralded S. Craig Zahler as a director to keep an eye on with his command of tone, pacing, and message. While some of that may still be true, his latest film "Dragged Across Concrete" tested my patience more than his previous two films did and showed me that maybe I'm not as big of a fan of the right wing writer/director as I previously was before. There is some dragging across concrete in this ultra-slow burn cop thriller but the real one who I feel got dragged the most was me. At nearly three hours long and a story that is as thin as they come, I think we may have given S. Craig Zahler too much credit and that praise is going to his head. Brett Ridgeman (Mel Gibson) and Anthony Lurasetti (Vince Vaughn) are a pair of police officers who get caught on a citizen's cellphone being rough with a suspect during a drug bust. Now the two partners are facing a six-week suspension from their superior officer (Don Johnson) without pay. This complicates matters for Ridgeman as he's a worn out cop approaching 60 in one month's time, with a wife who has MS and a daughter constantly being abused in their neighborhood, making his desire to want to relocate his family an issue. Lurasetti, who is not nearly as old as Ridgeman, wants to propose to his girlfriend. He already has the money for the ring but the wedding and everything else that comes after is weighing on his mind as well. Utilizing a connection he has from his years as a cop, Ridgeman sets up a bust which will give the two men all the money they need to carry on with their lives in a better situation financially. However, the plan becomes more dangerous and the supposed drug bust turns out to be an elaborate blood splattered robbery instead, putting both men in danger for their lives. As stated before, "Dragged Across Concrete" is long. Nearly three hours long. Does it justify its long runtime with an epic story or deep characterization? Absolutely not! There are large chunks of this movie that could've been exercised all together, including a scene involving Jennifer Carpenter which proved to be utterly meaningless a few (or more than a few) minutes later. We learn everything there is to know about Brett Ridgeman and Anthony Lurasetti early on and nothing new is ever added to their characterization despite the many long almost real-time played out conversations they have with one another, most of which take place inside of a car. This is simply a director showboating in his storytelling, believing that he's explaining something deep and meaningful (which he is), however, his execution is flawed and completely unnecessary. Zahler's message and theme does not come full circle until the film's final few minutes involving Tory Kittles' character (who is sprinkled throughout the narrative), by which point it had sadly already lost me as a viewer. Mel Gibson and Vince Vaughn barely have any chemistry together as a buddy cop duo who are fiercely loyal to each other. We've seen them both give compelling brooding performances of tough-guy masculinity before to better effect than this, so once again I have to place the blame at Zahler's feet. The violence in the film is also just as punishing, brutal and hard-hitting as Zahler's past two outings but this time lacking in both the emotional impact, as well as grindhouse horror impact it had before. Here, it feels more gratuitous and drawn out probably due to the lack of investment in the story and the characters. Seeing two cops go dirty in order to provide for their families is nothing new, nor does Zahler bring anything to it that we haven't seen before other than this excruciating long running time. His sensibilities as a director are still here but "Dragged Across Concrete" showcases the worst of them. This pulpy cop thriller features far too many scenes of dialogue which go on and on, while never pushing the story or the characters forward. It's a two hour and thirty-nine-minute movie that could've shaved an hour off and not missed a beat. 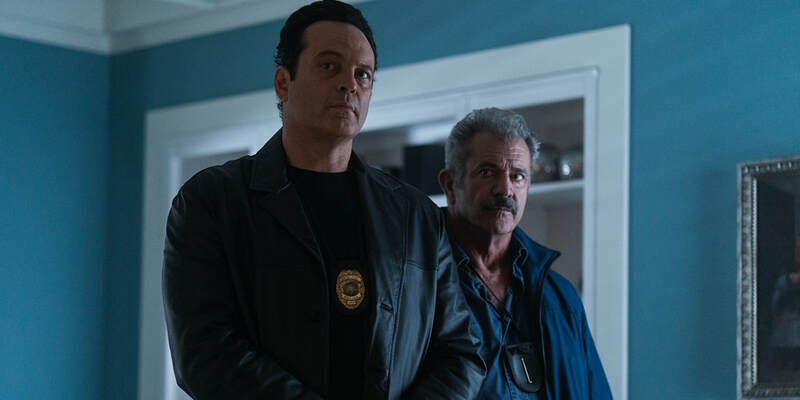 I do feel that Zahler still possesses a unique voice (even though I don't agree with him politically) and is providing movies that not many others are making today but "Dragged Across Concrete" is not how I like to spend such a long time at the theater with so little payoff.